The Change Lab showcases concerns of Development Education as part of the teacher training, in conjunction with the aims of the Ubuntu Network. 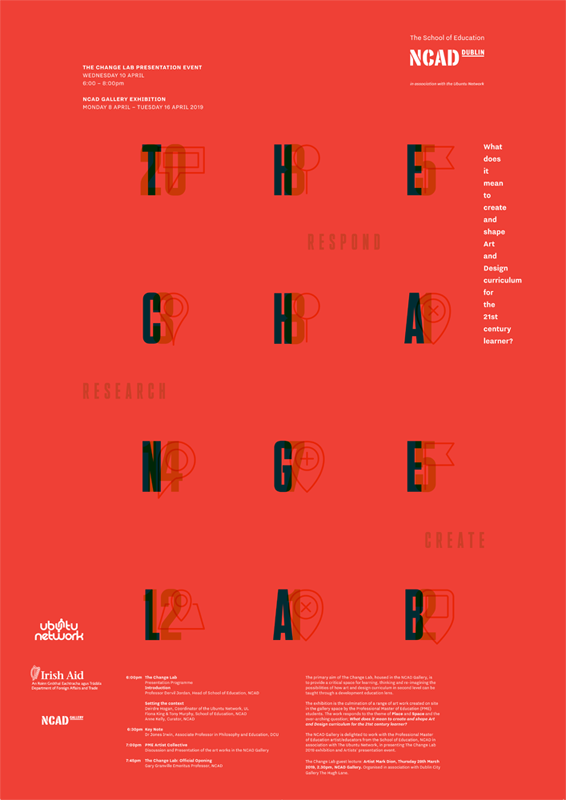 The Change Lab showcases concerns of Development Education as part of the Education Department teacher training programme at the NCAD, in conjunction with the aims of the Ubuntu Network. Development education is an educational process that is concerned with building a student’s knowledge, awareness and understanding of the world that they live in, and how that world is often an unequal one in terms of Human Rights and social justice (social justice is the view that everyone deserves equal economic, political, social rights, resources and opportunities). Education for sustainable development extends the context of Development Education to go beyond the social justice thematic parameters of Development Education to also include issues focusing on the environment and the importance of maintaining and protecting the planet while meeting our development needs. The NCAD School of Education Professional Master of Education students are exploring development education and education for sustainable development concepts through the lens of Art and Design, so it is important for us to ensure that the art processes and visual research methods, intrinsic to the subject of art, remain at the forefront of this exploration. Image: American artist, Mark Dion. We are delighted to welcome American artist Mark Dion to the National College of Art and Design to speak on his practice at the NCAD Gallery on Thursday 28 March 2019, 2.30pm. This is an event open to public audiences and all are welcome to attend. This event is organised as part of the NCAD Change Lab 2019 project exhibition in partnership with Dublin City Gallery The Hugh Lane on the occasion of Mark Dion's forthcoming exhibition Our Plundered Planet, 04 April - 01 September 2019. This exhibition coincides with EuroMAB 2019 a conference on Biospheres being held in Dublin Castle and Dublin Bay Biosphere Reserve, Ireland from 2 to 5 April 2019. Our Plundered Planet at The Hugh Lane Gallery offers commentary on human treatment of the natural environment, tempered with a dose of humour and playfulness. At a time when greenhouse gas emissions from human activities are at historically high levels and the polar glaciers are melting, Dion’s work poses the question of human responsibility - What is the relationship between human beings and our biospheres? Cultural and Capital ecologies—these are the systems Mark Dion observes as intrinsically linked and interactive. National College of Art & Design, 100 Thomas Street, Dublin, D08 K521, Ireland.